The crossover event of the century! RAW is Gritty! Who can forget Gritty’s on ice debut? The giant orange monster took quite a tumble… maybe he didn’t know that ice is actually VERY slippery? Last night's appearance though... it takes the cake. 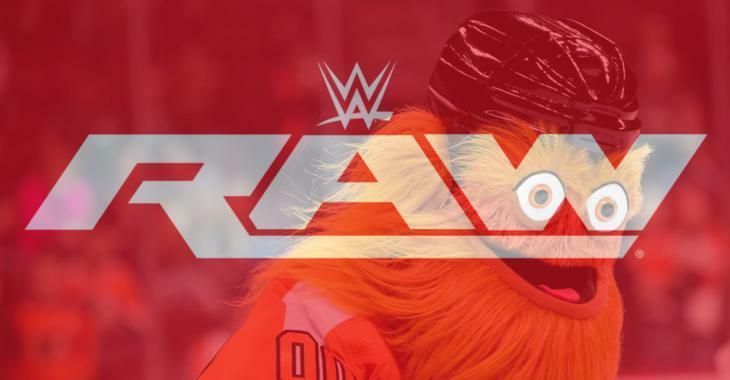 WWE fans may have noticed a GIANT Gritty face lurking in the crowd during last night's live taping of Monday Night Raw. The present beware. The future beware. He's coming. IMPOSTER! That's not the real Gritty! Unless... Gritty can be ANYWHERE... at least in spirit. Kind of like Santa Claus. Except, unlike Santa Claus, Gritty is real. Too real.